SIG Sauer Elite V-Crown 9 mm Luger 147gr JHP Ammo - Box of 20 | BUDK.com - Knives & Swords At The Lowest Prices! When it comes to guarding your life and property and that of your loved ones, you need ammunition with maximum stopping power that never fails, no matter the conditions. SIG Elite V-Crown 9 mm JHP Ammo fits the bill and then some. SIG Sauer - one of the most trusted names in firearms, worldwide - manufactures every round to the most exacting standards in the industry, backed by more than a century-and-a-half of ammunition innovation and know-how. Combining a fine-tuned design with perfected material specifications, these cutting-edge rounds deliver unrivaled on-target energy and stopping power. The key to this exceptional ballistic performance is a perfect storm of exclusive, state-of-the-art features, starting with V-shaped jacket skives and scores. Combined with an additional stacked hollow point cavity, these distinctive components yield extraordinarily controlled, uniform expansions, shot after shot. 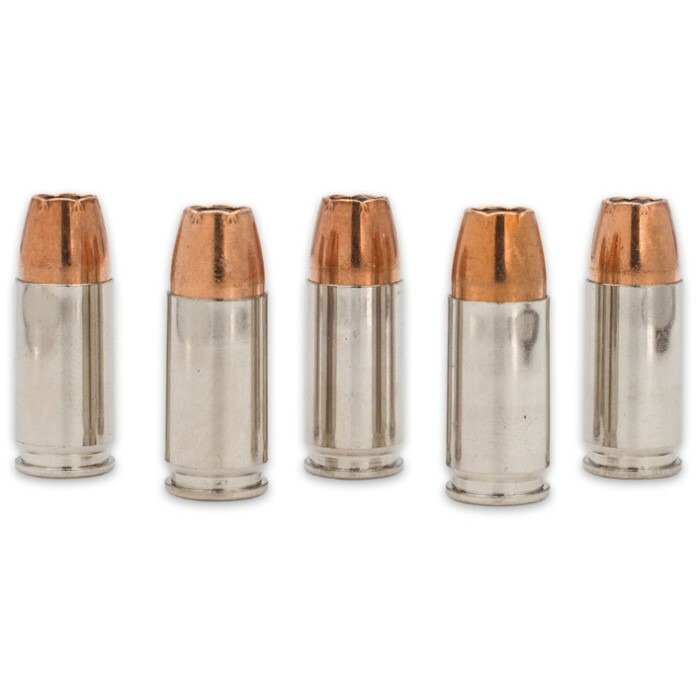 Upon impact, every SIG V-Crown bullet forms a perfect, symmetrical mushroom. Add in the unique toothed cannelure, and the result is a round with superior weight retention, maximum terminal expansion and optimal penetration depth. Nickel cases provide enhanced lubricity, remarkable corrosion resistance and reliable feeding/extraction, while low-flash propellant offers discretion when shooting in the dark and improved vision in low-light scenarios. Boasting an impressive 985 fps muzzle velocity and a whopping 317 ft/lb muzzle energy, these jacketed hollow points are the industry’s preeminent defense rounds. 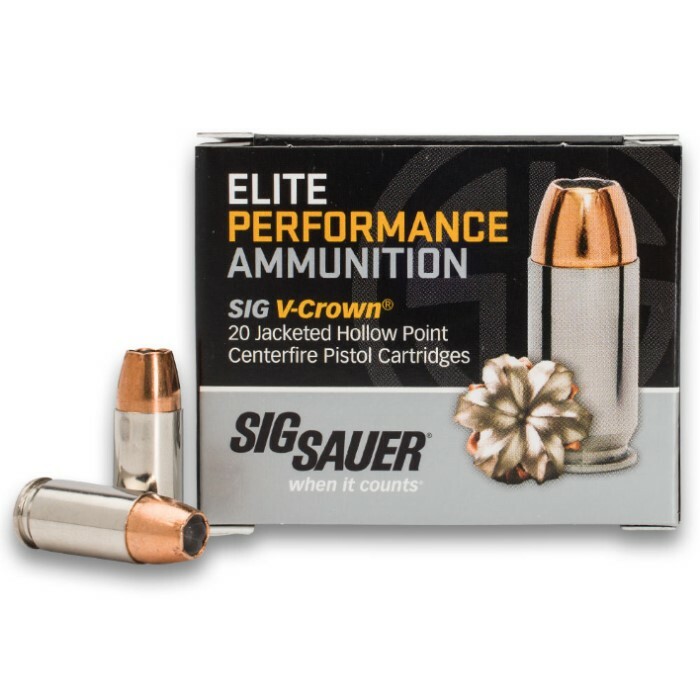 Get the most from your trusty 9 mm by loading it with SIG Sauer Elite V-Crown 9 mm 147gr JHP Ammo. 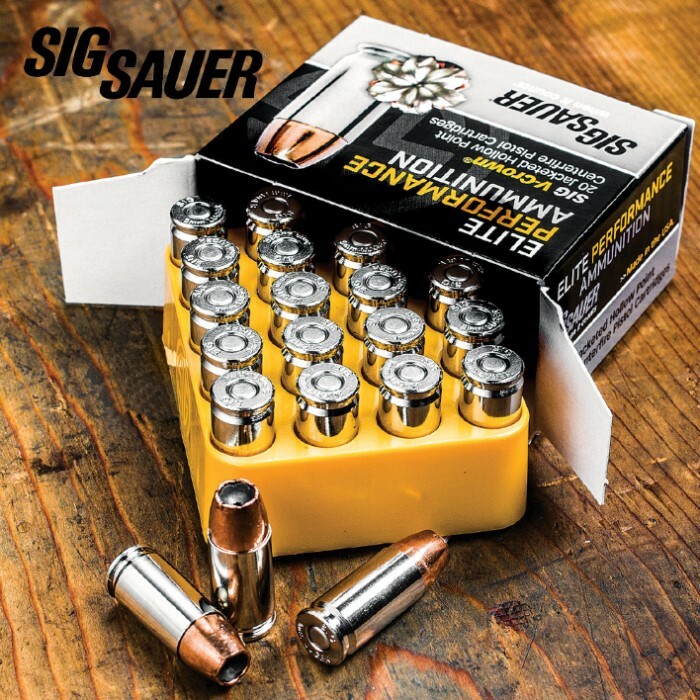 You won’t find a better price on SIG Sauer bullets anywhere else, so stock up on these handy 20-round boxes today!